The wait is over! Just in time for the warmer weather, Stella Luna has opened its second café in Hintonburg (1130 Wellington St. W. at Rosemount) in the new Tamarack Wellington Building. 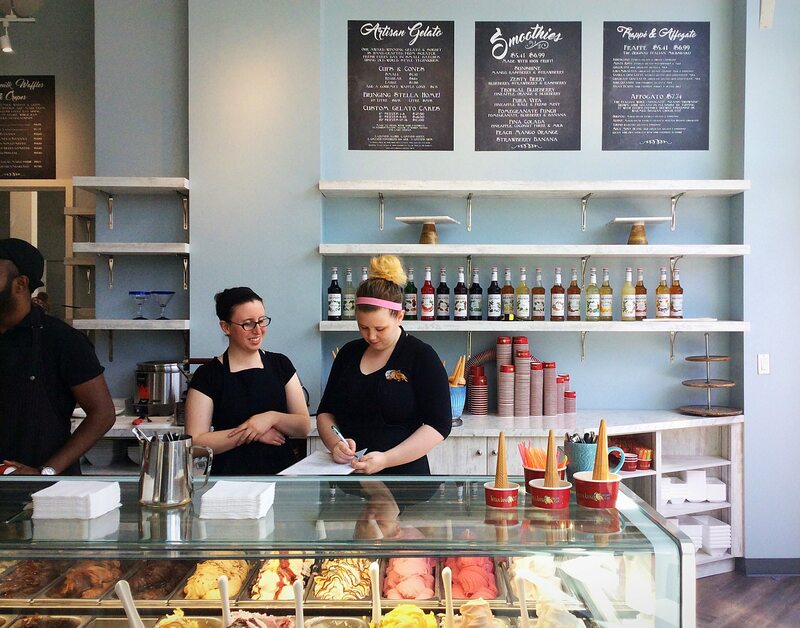 Regular City Bites readers and gelato aficionados will recall that Stella Luna co-owner Tammy Giuliani won big last year on the World Gelato Tour with a chocolate gelato combined with bourbon, ganache swirl, and maple-candied pecans. We can hardly wait to see what flavours she has dreamed up for 2017. The new state-of-the-art gelato display freezer — straight from Italy, we’re told — has space for 24 flavours. City Bites Hot Tip #1: Watch for it! In the near future, Stella Luna has plans to offer Italian spuntini (the Italian version of tapas), along with wine and local craft beers, at both its Old Ottawa South and Hintonburg gelato shops. City Bites Hot Tip #2: Go off-peak and take the time to enjoy the ambiance. Coffee, crepes, and paninis are also on the menu, so go with a friend, stay a while, and admire the decor. Unlike the more rustic flagship Stella Luna, this new café has soaring ceilings and a chic-bar vibe. Like the flagship, this café also boasts great views of a bustling streetscape. There’s also a side patio and, once construction finishes up next door, a sunny park area adjacent to the patio.